이용방법 : 건성피부, 각질 등에 발라줍니다. Solution: Pure Vegetable Glycerine is an outstanding moisturizer and skin cleanser that also provides softening and lubricating benefits. It's hypoallergenic and easily soluble in water, making it suitable for use in all of your favorite cosmetic applications. Pure Vegetable Glycerine has a long shelf life and does not easily oxidize. 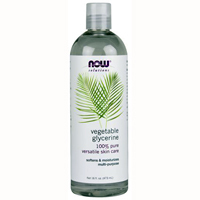 It is a natural product derived from Non-GMO palm oil or vegetable oil. NOW® Solutions products avoid harsh chemicals and synthetic ingredients in all of our formulations, to provide a more natural product line.Suggested Use: For soft, luxurious skin simply massage a few drops of Pure Vegetable Glycerine on the desired area as needed. Discontinue use if redness or irritation occurs. The vegetable glycerine contained in this product is considered food grade. NOW Foods does not test on animals. Please Recycle.